Learn how life can be enhanced, how a corporate culture can be changed, how a family can be united—by living the simple lessons of a third-grade dropout. We live in an era of low expectations. In fact, we tend to celebrate low expectations. The way in which we choose to live and work today is a far cry from the purposeful living of our parents. Have we reached the point in our society where it is more important to look good rather than be good? Has the pride in doing good work been replaced by self-entitlement, perfect offices, and slick suits? A generation that worked hard without complaining.A generation that did whatever was necessary to support their families.A generation that took pride in doing a good job.A generation that had high expectations for themselves and the others they were responsible for.One such member of this generation was a third-grade dropout, a man who never hid behind any excuse. A man who never allowed his problems or lack of a formal education to determine his present or affect his future. A man who realized that destiny was a choice and not a chance. This book communicates lessons from that man’s life—the kind of wisdom that is rare in society today. It’s the kind of wisdom that will help you be a better person, a greater leader, a more effective worker. 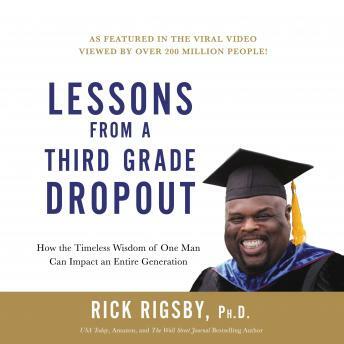 That man was Rick Rigsby’s father, and this book contains his impactful, far-reaching story—of how a life can be enhanced, of how a corporate culture can be changed, of how a family can be united—by living the simple lessons of a third-grade dropout.